Uses an anachronistic age-verification quiz at launch, which is also present in the digital re-release. See: Issues fixed. 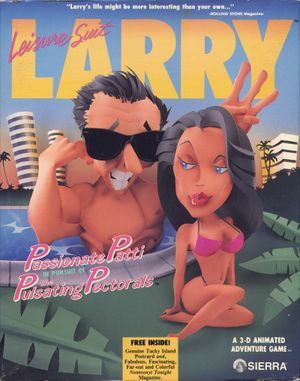 Included in the Leisure Suit Larry bundle, comprising Leisure Suit Larry 1 - 6. For details see: Version differences. Pre-packaged with ScummVM 1.8.0. The GOG.com re-release retains the manual-based copy protection of the original game. See: Issues fixed. This fix is for the GOG.com re-release. 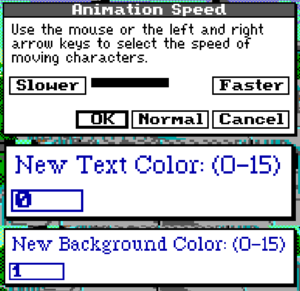 It will correct the aspect ratio and increase the number of colors from the default 16. The GOG.com re-release uses ScummVM configuration file lsl3.ini. Only Master volume can be adjusted. Due to its "adult" nature, the game uses a period-correct trivia quiz to verify the user's age. These questions have to be answered every time the game is launched. After you input your age, on the screen with the first question, use the following key combination to skip the quiz: Alt+Ctrl+X. The GOG.com re-release provides the correct answers in <path-to-game>\LSL3 Answers.txt. The game uses manual-based copy protection, which is also present in the digital re-release. A code has to be entered at specific points in the game in order to progress. A list of codes is provided by Al Lowe on his Humor Site. The GOG.com re-release provides a copy of the game manual in <path-to-game>\Leisure Suit Larry 3 - Manual.pdf. ↑ 2.0 2.1 File/folder structure within this directory reflects the path(s) listed for Windows and/or Steam game data (use Wine regedit to access Windows registry paths). Games with Steam Cloud support may store data in ~/.steam/steam/userdata/<user-id>/765850/ in addition to or instead of this directory. The app ID (765850) may differ in some cases. Treat backslashes as forward slashes. See the glossary page for details. This page was last edited on 30 March 2019, at 17:44.